25 years ago today – it was a Thursday –, I came home from school, in that idyllic world that was Hamburg-Harburg (Heimfeld), I chucked my school bag into a corner, and I started watching Knight Rider (’cause, as I am sure you know, all Germans back then were bizarrely obsessed with everything David Hasselhoff – or not…). My viewing pleasures got crudely interrupted by the most bizarre press conference that I have ever seen. One day later, after school on Friday and after a long drive, I was back in my home town of Berlin, celebrating, with my father and my grandmothers, the truly unbelievable and unimaginable things that had just started to happen – crossing a border repeatedly which previously I could only pass at gunpoint. I had great hopes back then – hopes of a better, more peaceful world, a world that would finally come to its senses. Carmen Epigraphicum Berolinense (a P. K. fictum). uitandas faciles ad fera bella manus. that are easily given to fighting savage wars. 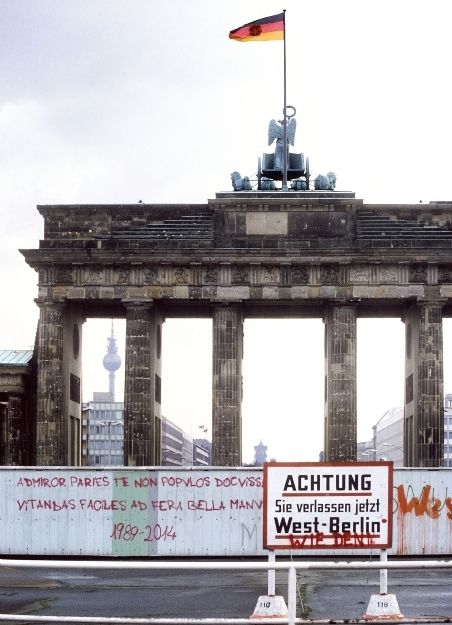 This entry was posted in Carmina Epigraphica and tagged Fall of the Berlin Wall. Bookmark the permalink. That’s fantastic – thank you for that, Peter! Love it! Rectissime dixisti. Tamen miror ubique terrarum cotidie nova bella nasci. Quod ne fiat, discipulos nostros Latine doceamus.